The Wintergarten Orchestra is again the star attraction at the Revue Cinema's annual fundraiser! We're proud to be the featured performers at the annual ACTRA awards, recognizing the achievements of Toronto's ACTRA members. The hottest show-business party in town! 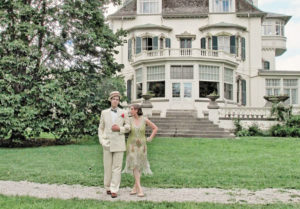 The Wintergarten Orchestra will be the star attraction at the annual Gatsby Garden Party at the Spadina Museum, on June 24th and 25th from noon until 5 PM. This is perfect venue to see and hear the band, and you don't need a time machine! The Wintergarten Orchestra is pleased to be part of a new concert series "Jazz on Jarvis" at the Berkeley Bicycle Club in the historic Gooderham mansion on Jarvis Street. This intimate venue features beautiful period interiors including a conservatory bar, music room and spacious patio. Come and hobnob with us- no cover charge!